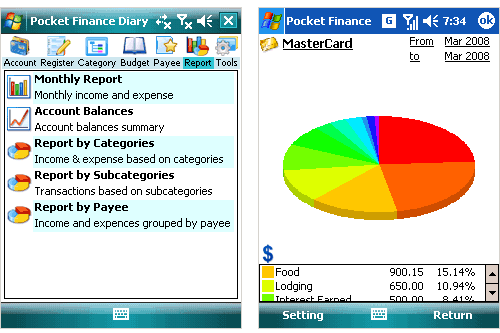 Pocket Finance Diary is a fast and easy to use stand-alone Pocket PC solution for personal finance management. Pocket Finance Diary is a tool for your every day use, allowing you to control your expenses easily. Installing Software from a CAB File. By default the installation will be made into the default Program Files folder. Some programs (e.g. 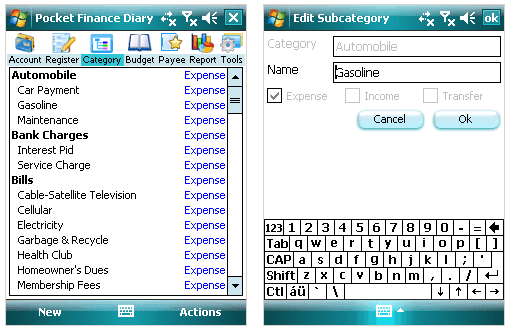 CAB Install) allows you to install Pocket Finance Diary into the specified folder. With CAB Install you can also install Pocket Finance Diary on memory card. Install from Windows-based desktop computer using Microsoft ActiveSync. Keep track of the Expenses and Incomes every day. Addition of new transaction or editing existing by double-clicking it. Addition and editing of categories / subcategories. 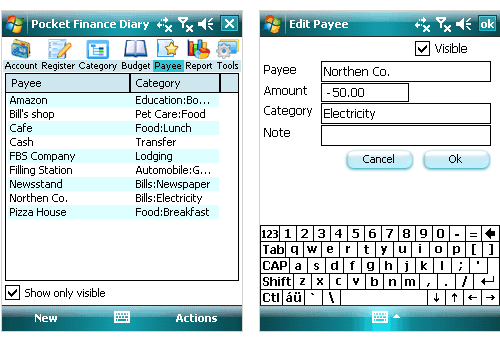 Addition and editing of payees. This application will install and run on the Microsoft 2003 OS Pocket PCs and the Windows Mobile 5 and 6 OS devices. Requires a device that uses a stylus and touchscreen for input.